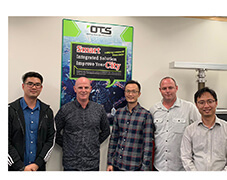 We are thrilled to announce the partnership has been formed up by Be Alarmed Ltd and OT Systems Ltd in New Zealand. Be Alarmed Ltd is a professional security service provider, specialized in communication technology and equipment distributor in New Zealand. Over 25 years experience in servicing consultation and installation of security surveillance systems, the company is absolutely competent in building up any security solution. With this partnership, Be Alarmed will distribute OT Systems’ IoT surveillance solutions and provide local service support. OT Systems is a mobile surveillance and IoT solution provider with a unique one-stop integrated system driven by the Internet of Things and big data to accurately address challenges in various industries such as environmental protection, city infrastructure planning, traffic control, construction site safety and security etc. Our IoT and big data solution platform have been deployed in various government and construction projects with considerable satisfaction. It breaks the limitations of fixed monitoring, and greatly enhances industry management capabilities in data acquisition & software and hardware integration systems. www.ots-iotsolutions.com | Copyright © OT Systems Ltd. All Rights Reserved.